Viro, the leading manufacturer of environmentally friendly all-weather wicker, announces an innovative woven surface treatment that is 100% recyclable, pest free and water proof. These age-defying beautiful woven panels can be custom manufactured to meet the most discerning contractors or architects design specifications. Viro understands chemical sensitivity, energy efficiency and the environmental impact of this product. The materials are made from HDPE instead of PVC. This choice is significant because, while PVC is less expensive, there is a caustic problem associated with PVC at the end of the product life cycle. When PVC is burned, it will break down to toxic chemicals such as dioxin and hydrochloric acid. The by-product of HDPE on the other hand is similar to what is produced by burning candle, CO2 and H2O. The Mulia Resort in Nusa Dua, Bali, (www.themulia.com) created freestanding exclusive luxury villas with low environmental impact. The villas are surrounded by lush green gardens, private paths to hydrotherapy pools and steps away to a pristine beach. 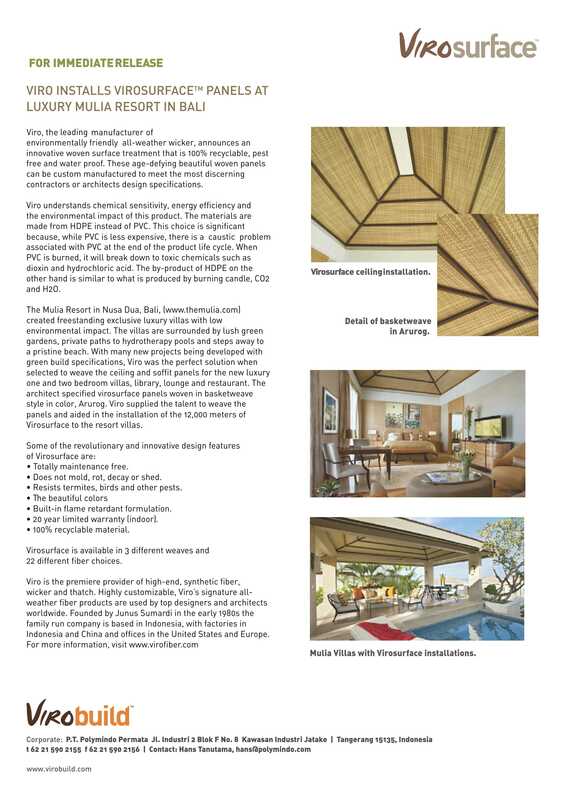 With many new projects being developed with green build specifications, Viro was the perfect solution when selected to weave the ceiling and soffit panels for the new luxury one and two bedroom villas, library, lounge and restaurant. The architect specified virosurface panels woven in basket weave style in color, Arurog. Viro supplied the talent to weave the panels and aided in the installation of the 12,000 meters of Virosurface to the resort villas. • Resists termites, birds and other pests. • Built-in flame retardant formulation. • 20 year limited warranty (indoor). Virosurface is available in 3 different weaves and 22 different fiber choices. Viro is the premiere provider of high-end, synthetic fiber, wicker and thatch. Highly customizable, Viro’s signature all-weather fiber products are used by top designers and architects worldwide. Founded by Junus Sumardi in the early 1980s the family run company is based in Indonesia, with factories in Indonesia and China and offices in the United States and Europe.